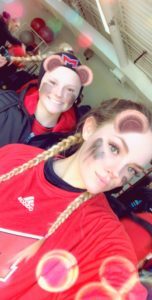 Alexis Roe (left) and Madeline Heintz (right). Photo courtesy of Madeline Heintz. 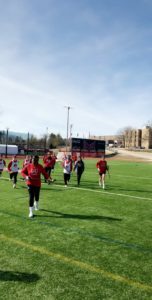 This spring is Maryville University’s first ever Women’s lacrosse season. The first-year team consists of 22 players from all over the country, including Jessie Hynes, from Nova Scotia. She is most excited, “to get out on the field and yard-sale some girls”. The season begins against a local team from Lindenwood University. The game will be held on the Maryville lacrosse field Saturday Feb. 9, 2019. Lindenwood University is a nationally ranked team in the top 4. This will be a big game for Maryville to start the season against a powerhouse team. The Saints will start their first season on brand new turf. The field is currently shared with the men’s lacrosse team and the soccer teams but is home base for women’s lacrosse games and practices. Next year the team will get a new lacrosse field along with a new field house and locker rooms. 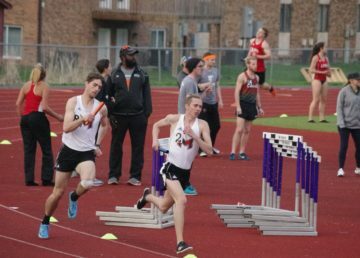 Lewis University and Rockhurst University are the team’s rivals, although the team is working hard to establish themselves in their first season with as many wins as possible. Brittany Frankenfeld is the first head coach of Maryville women’s lacrosse history. She is a former lacrosse player herself. Her favorite part about coaching the team is, “to see the girls grow from athletes to lacrosse players was an amazing experience. They fell in love with the sport just like I did,” Frankenfield said. To cheer the team on, make sure to be at their next game on Feb. 23 at 12 p.m. on the Maryville lacrosse field. Also, be sure to keep up with the team on Instagram. Team warm up. Photo courtesy of Madeline Heintz.